"Everything's Coming Up Lane Bradbury" at Don't Tell Mama in NYC. In the summer of 2017, I attended Lane Bradbury's latest incarnation of her one woman show Let Me Entertain You, Again, written by Doug DeVita, directed by Lane's daughter Elkin Antoniou, and musical direction by Joe Goodrich. 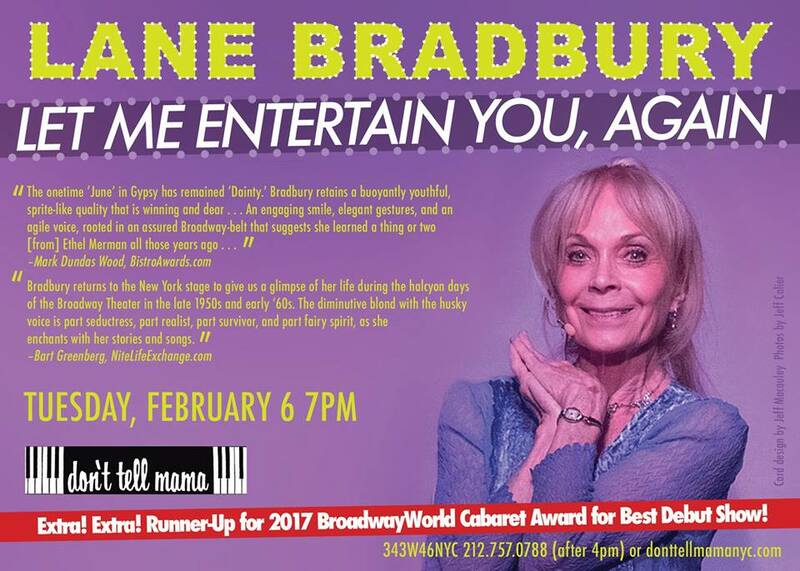 This was my 3rd time attending Let Me Entertain You, Again, Lane's autobiographical personal tour of how she went from Atlanta Debutante to performing on Broadway during its Golden Age of Musicals (in the original production of Gypsy, starring Ethel Merman). I have seen almost every incarnation of Let Me Entertain You, Again since Lane debuted it at Abingdon Theatre in 2013. This summer's performance was by far the strongest! Lane has truly grown with this show. At 79-years-old, Lane belted and delighted the audience with her powerful vocals. I was so impressed with Lane's voice that I couldn't wait for her to break into song again. Her stories are fun, especially when she talks about her time in the original Broadway production of Gypsy starring Ethel Merman and directed by Jerome Robbins. Lane definitely heated the air conditioned room up when she spoke of her hot love affairs. The flames really roared when Lane talked about her love with Eddie. I could sit and listen to that story for days! The show is filled with some of my favorite musical theatre songs: "Corner of the Sky," "Another Hundred People," "If Momma Was Married," and "Everything's Coming Up Roses." I get excited each time Lane sings these timeless tunes. Aside from a few small changes, Doug DeVita's script has stayed in tact for the past five years that Lane has been performing this show. Doug did an excellent job weaving Lane's life into Let Me Entertain You, Again! Now, everyone has another chance to see Lane light up the stage with her energy and enthusiasm! Let Me Entertain You, Again will return to Don't Tell Mama (343 West 46th Street, between 8th & 9th Avenue) on Tuesday, February 6 at 7pm! Click here for tickets!